On this episode, the gang takes a vacation to Riverdale and (spoilers) murders everyone. Get ready to have your mind blown about Archie’s universe. 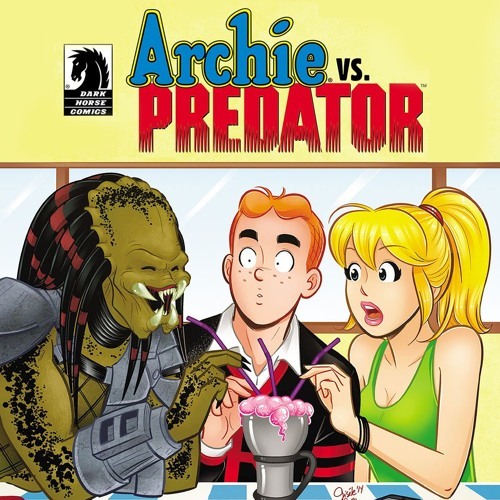 Archie vs Predator! In this episode, we welcome/kidnap Liz, our resident Archie “expert,” who’s way too nice, professional, and informative to have to deal with us jerks for over an hour, especially when Sly says she’s not a real person. If this is your first episode, we describe in detail how we handle the narration and where our characters’ colorful dialogue comes from. If it’s not your first episode, we describe in detail how we handle the narration and where our characters’ colorful dialogue comes from. We really try to shoehorn which of us are which Archie characters. Ryan’s apparently never seen any good movies, unlike renaissance man Sly, who’s NEVER EVEN SEEN HOCUS POCUS. Sly announces the newest Divisive Issues contest. Phil can’t take a compliment and really needs a nap. Darryl gives his classic PSA, too late to nap. This episode brought to you by the power of Mick Jagger.